If you haven't tried PANKO! Wow, this is one amazing cookbook!! I'm drooling and it's just 5 in the morning, lol!! Thank you so much my friend for including my recipe as well!! Rose, SUSAN I JEWEL....Thank you all for your comments...and you're recipes. I am making Susans, fried green tomatoes...for dinner tonight..
What a great Cookbook !! 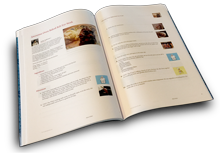 Many Fantastic recipes included !! Also like Pork section page 65 & 71. Stewed Tomatoe Bake on page 78, Potato Sticks on page 80, Healthy Baked Onions on page 88, Mac & cheese on page 101 and Panko Mozzarela Sticks on page 105. Great cookbook!! Thanks, Nancy! Great cookbook, and lots of good ideas for using Panko bread crumbs. Sometimes I make my own panko crumbs - I make toast, apply a little butter, then put the slices in the blender. YAY! Ma...another great cookbook. Starting out with a recipe for making your own Panko bread crumbs (page 5)...way to go!! this is a great book as I am always looking for ways to use those wonderful Panko crumbs. Thanks for including me!! I feel like I have a buschel basket of compliaments!!! Wow what an amazingly wonderful cookbook, with so many uses for Panko Bread crumbs. Phyllis the YELLOW ROSE OF TEXAS is gonna go crazy when she sees all of these great recipes. I started her to using Panko Bread Crumbs, and now she can order a whole cookbook of Panko Breaded items. Mom you did a wonderful job and thanks so much for including many of my own personal favorites. This is a great book, & I love it. GREAT JOB.